Reading Group discussions (January, March, July, September, and November): We meet on the second Sunday of the month @ 1pm. Please take a moment during the week before the meeting to call the host and reserve a place, and if possible, bring something for the tea table. For more information, please contact our Secretary (see our Contacts page). For info about shared transportation to events, please visit our Carpooling page. Exciting news about our annual Birthday Celebration! There will be a luncheon and English country dancing. Members are welcome to come in costume and participate in the dancing -- or come and enjoy the general splendor. More details available on the invitation, posted here as a PDF document. Our chapter will be hosting a new member meeting. 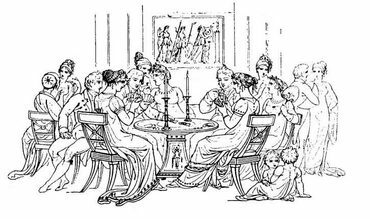 It is a meeting intended for "newish" members, for members who are less familiar with Austen's works, and for those who would like to welcome new members into the group in a more personal way. We will be discussing Pride and Prejudice, and those present will be able to drive the discussion and ask questions. --> Click here to download the invitation and RSVP information. Dr. Anita Fisher, a history professor at Clark College and colleague of our own Pat Fulbright, will be discussing social and economic issues in the time of Jane Austen. An exciting update! We will have a tag sale during the Spring Luncheon. Please bring anything related to Jane Austen and her life to donate. Items will be placed on tables according to their estimated value; we will have three tables with items priced at $1, $5, and $10. All unsold items will be donated to charity after the event.